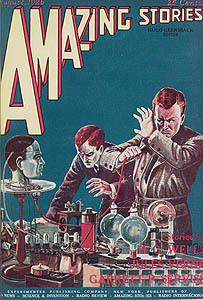 Book Hugo Gernsback, editor. Amazing Stories. New York : Experimenter Publishing Company, 1926. Notes Illustrates an episode in this month’s story, The Talking Brain, by M.H. Hasta. Here we see the rash, famous scientist at his wits’ end listening to the live brain, contained in the skull, by means of the Morse code..